An outdoor structure adds a visual element to your yard with style and beautiful design. An outdoor structure adds a visual element to your yard with style and beautiful design. If you are looking to enhance the design of your landscape this year, why not add a pergola to your yard? In addition to adding a stylish look to your landscape design, they also offer a set of unique benefits to your outdoor space. As you consider the many pros and cons of each outdoor feature, consider the many reasons to add a beautiful pergola to your home. Add a simple yet beautiful accessory to your landscape design with a pergola for your space. With flowers, lights, and seasonal decorations, these structures can seamlessly become a central focal point of your landscape and add an element of style to the look of your home. 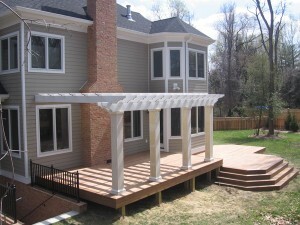 As a stylish centerpiece to your landscape design, pergolas can quickly enhance the curb appeal of your landscape. Let our team of experienced professionals at Mid-Atlantic Deck and Fence build and install a beautiful vinyl pergola as the newest addition to your landscape. Their vinyl material makes pergolas low maintenance and easy to clean throughout the year. Although a pergola may not offer the same amount of shade as a gazebo, it can easily provide shade to individuals who use it as a seating area, or coverage for people who may be enjoying your hot tub. These structures are also able to build additional coverage on bright days if you want to add a cover to create more shade for that particular space. Accessorize your outdoor space by expanding your garden in, around, or on your new pergola! Pergolas provide plants with a strong support feature to grow on, especially for climbing plants and vines. These structures are also great for housing your hanging planters, allowing you to extend and build upon the colorful look of your landscape design. Like gazebos and patios, pergolas are useful for sectioning parts of your landscape into more defined areas of your yard. For families with hot tubs or other designated entertainment areas, a pergola is especially useful for outlining these sections of outdoor living spaces. Ready to Update Your Deck for Summer?